SP Lite2 is designed for routine measurement of solar radiation. It is especially designed for Photovoltaic / solar energy module monitoring. SP Lite2 can be used under all weather conditions. The sensor measures the solar energy received from the entire hemisphere. It is ideal for measuring available energy for use in solar energy applications, plant growth, thermal convection and evapotranspiration. SP Lite2 uses a photodiode detector, which creates a voltage output that is proportional to the incoming radiation. Also due to the unique design of the diffuser, its sensitivity is proportional to the cosine of the angle of incidence of the incoming radiation, allowing for accurate and consistent measurements. SP Lite2 is easy to use. 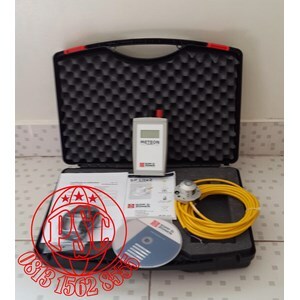 It can be directly connected to voltmeter or data logger. Direct readout in Watts per square meter ( W/m² ) can be derived from the measured voltage divided by the calibration coefficient. It is fitted with the Kipp & Zonen high quality yellow cable. SP Lite2 features adjustment screws and a bubble level integrated in the mounting flange for your convenience. A threaded hole in the body of the housing takes our accessory screw-in mounting rod. Two instruments can easily be bolted back-to-back amd fitted with a mounting rod to make a simple albedometer. METEON is an accurate hand-held display unit and data logger for the measurement of solar irradiance. Its small size, long battery life and universal input make it an ideal tool for many test and field applications. METEON is primarily intended to display real-time radiation values in Watt per square meter or PAR in micro-mol per square meter per second. Configuration with a computer is simple, using the supplied software and USB interface cable. Just select the radiometer type from a list, enter its sensitivity, and the correct measuring range is automatically selected. Once METEON is configured, connect the radiometer, switch on, and the large 4-digit display directly shows the correct values. This makes it a perfect tool for convenient use in the field. The great advantage of the METEON is the integrated data logging function that can store up to 3500 samples. It stores minimum, maximum and average values per logging interval. With the included software you can present the logged data graphically and it can be exported to spreadsheets, such as Excel™. Optional METEON can be ordered pre-configured with a radiometer as a complete irradiance measurement kit.